I have just had a good meeting with my MP. I kept the agenda firmly on the rights to canoe our nations' rivers and for DEFRA to follow the current legislation (1472 Act. Wears and Fishgarths). John Pugh MP willingly spoke to me about canoeing and access to our rivers. He questioned me, "where does a river become an un-navigable stream?". He raised issues related to Royal estates in Scotland and canoeing on rivers that crossed those areas, I pointed out that Scotland has the Land Reform Act and allows responsible access to land and waters of Scotland. I also pointed out that waters were included in the Countryside & Rights of Way Act but were removed following lobbying from estates, fisheries and riparian owners. John read the petition and agreed to present it in the House of Commons, (he said he would check the presentation of it to ensure that it is legally acceptable but correctly assumed we had been given advise) he seemed to relish the idea of overcoming the assumed rights of landowners, riparian owners and estates etc. I pointed out that I required the petition to go through the correct procedure in the House and not simply handed to DEFRA. He added before I had chance to say anything, "...and be placed in a bottom draw." Altogether the meeting was positive and John Pugh MP was willing to present it to the House of Commons. It will be mid October before that can happen so we await with bated breath! This subject now deserves its own thread. "Since 1842 the action taken by the House on Petitions has usually been minimal. Petitions are currently sent to the relevant Government department. The department will generally investigate the case that the petitioners have made and a Minister may lay a reply to the petitioners' case before the House." It will be up to us to encourage key MPs to press for a substantive response from DEFRA. MP's who have been supportive in the past, MPs on the relevant Select Committee, MPs with specific issues in their constituency (Dee, barbed wire on the Kent, Rivers with Statutes covering Navigation which are denied by riparian owners e.g.Hampshire Avon and River Itchen.) need targeting by their constituents. If you think you can help please post here or PM me. A little while ago I posted on this site that I too had sent a petition to my MP - Ed Vaisey. He in turn wrote to Richard Benyon enclosing a copy of my letter and the petition. I have today recieved a reply. Lord De Mauley as Deputy Minister replied back to Ed Vaizey on behalf of Richard Benyon. In his letter he mentioned that I had previously been in communication with the Department (DEFRA) on the subject of access. And that they had replied. He said that they would continue to confirm their commitment to local agreed voluntry access agreements as the main way to increase access to water for canoeists. So we shall see no support from Richard Benyon, Lord De Mauley or Ed Vaizey. Lord De Mauley as Deputy Minister replied back to Ed Vaizey on behalf of Richard Benyon. Did he make any attempt to deal with the issues in the petition? A public right of navigation can only be removed by statute or exercise of statutory power. There hasn't been one so the PRN still exists. ask Defra to follow Parliaments will or show by what authority they do there own thing. Because this went in through the back door they have tried the usual fob-off. We need to get some MPs and press sufficiently engaged that they take offence if parliament is fobbed of in the same way. I have been back and forth with my MP (a Conservative no less, who seems to agree with me that rivers should be open), who has been supportive passing my communications back and forth between Mr Benyon and myself (I always went through my local MP to ensure he took note of my letters). Though in the end I was banging my head against a brick wall. I am certainly prepared to take it further although I need a bit of advice as to what my wording and emphasis should be with regard to this development? All we need is MPs who will take an interest in ensuring that Defra give a substantive response to the Petition. I'll be in touch again Simon when the petition is "in the bag"
Plus any who have been supportive to you in the past. Last edited by KeithD; 16th-October-2012 at 09:23 PM. I have sent a reminder to John Pugh MP. I've got to keep him hot! "Hi John, I hope you have managed to place the petition I gave you in the Speaker's Bag. I eagerly await a response. 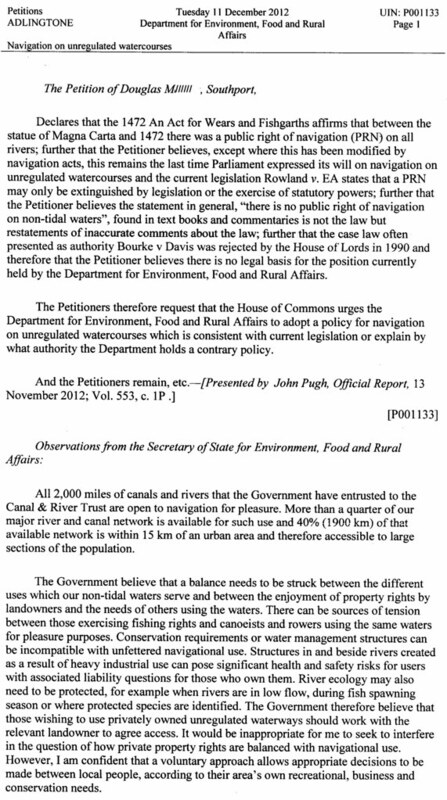 DEFRA have been asked many times about access to rivers for canoeing and other non-powered craft and swimming. They and R.Benyon MP have always responded with, "The policy is to make agreements with the riparian owners and those with fishing rights." or similar wording. This suggests we do not have the right to canoe our nations rivers. Yet the 1472 Act. Wears and Fishgarths seems to be the current legislation and allows access to rivers for non-powered craft(water craft at the time were driven by current, wind, man and beast of burden). DEFRA have ignored the current legislation and quote that, There is no established legal right of navigation. This is incorrect unless DEFRA can produce evidence of parliamentary changes to the 1472 Act. In regards to the Voluntary Agreements suggested by DEFRA, they did not work for Ramblers and the CROW Act was brought in to overcome the intransigence of land owners. They had to wait over 100 years for The CROW Act to give walkers some of the rights they needed. Canoeists and other water users should not have to wait another 100 years when we have an Act that is in our favour." This one is mine in Northern Ireland. If you can send that draft, I'll post it on. Thanks sc0ut. I'd already picked this up from your registration as a supporter for River Access For All. Margaret Ritchie's importance is that she is on the Select Committee for Environment, Food and Rural Affairs and therefore ideally placed to monitor that we get a full and meaningful response to the petition - once it's in the bag. We'll contact you when that happens. I live in Clywd South - how can I help - can you send me the sample draft letter? Thanks for registering as a supporter of River Access For All, Dan. Your MP, Susan Jones, Labour has not been in parliament long enough to have established a voting history on the subject of access to our rivers. We will need to ask her to engage with the issue, hopefully as an informed supporter and take an interest in Defra's response to the petition. Her position on the Welsh Affairs Select Committee can be helpful in building awareness that there clearly is already a public right of navigation which neither Defra or the Welsh Assembly reflect in their current policies. As the MP covering the Dee at Llangollen there will obviously be an opportunity to engage her concerning the local situation on the Dee. We will be in touch with a draft letter when the petition is "in the bag" behind the Speakers chair. Last edited by KeithD; 31st-October-2012 at 01:06 PM. The moment we've all been waiting for, (roll of drums maestro please). The petition has (not) been answered. The Sec. of State for Environment, Food and Rural Affairs has simply restated his usual answer and in typical politic speak ignored the question. 2000 miles of regulated water does not provide the variety that can only be found on many natural rivers. These other rivers, over 42,000 miles of them, some are used with or without agreement. The tension that this creates is due to the unfounded belief that riparian owners and fisheries can have exclusive access. Property rights - They do not own the water. Conservation - The EA have shown that canoeing does not interfere with the natural habitat. Most damage to rivers is from agricultural pollution and effluent from sewage processes. Structures, H&S, Safety - Is a red herring. Privately owned unregulated waters - The water is not privately owned. A fishing right may be owned. A river bank and bed may be owned. Voluntary agreements did not work for ramblers in over 100 years of trying, so the The Countryside and Rights of Way Act 2000 had to be introduced to open the countryside for recreational use. I will reply through my MP with my observations and I am prepared to modify them if better suggestions can be put forward by the members. Or better still, Get Your MP's involved! Get writing, support this action, if not for yourself but for other river users and our youngsters. He hasn't answered the question. Again. If you need an analogy Doug, the one I used when I contacted my MP and went back and forth with "Mr" Benyon was that the idea that the 2000 miles of managed canalised waterways is good enough is equivalent to telling a rambler or a countryside walker that they should be satisfied with the many pavements that are available to walk on!